woman figure, with a colorful hair, and a red face. A bird in her hair. Within the abstract emerges the wise jester. He is distinct and very powerful. A scenery of an abstract ocean. A figure and patterns in the ocean world. Flowery shape above a rush of water. Colorful and bright. Movement of colors within the whites. Greens and oranges are dipping in a shifting pool of light and reach colors, blues, pinks, etc. 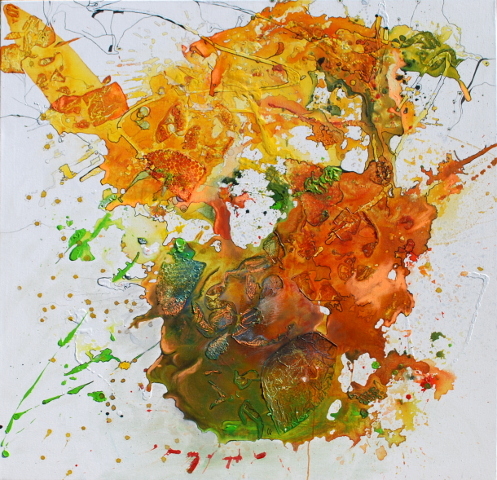 Outburst of colors forms an explosion on the canvas. Lots of colors. Strong vibrant colors form strong energy, like a stormy wind. It feels as it is moving, forming shapes in the scenery. within pool of colors, turquoise, red, white, black, forms a heart, alive and beating. The blossom of summer. Flowers, floating shapes, formed into a reach composition of bright and passionate colors. A red shape is central to blue surface divided into different sections by thin black charcoal lines. light blue shapes and flowers, moving within the purple, forming crystallized raw shapes. Splash of colors, forming a movement of lines and shapes. The light blue, purple, green merge together into raw patterns. Like a bouquet of flourishing flowers, a gift. What was she thinking? Is it important, her hair? No, her hair is her beauty, it tells her life story. So maybe it is important. On the stage, moving in the shadows, makes him mysterious, appealing. What will he do next? It had deep shines within the darkness. The most magical I could find. A whole world in one form. I saw this with my own eyes, and still cannot believe it. Where is all that beauty coming from? Water flows, pulling the beauty down under, as no force has done before. Is it magic or does dark await it? Like chestnuts smell in the autumn breeze, they come fly as they always have been here, caressing us with their light, the butterflies. It calms me down, I can look into it for hours. There is a very delicate story hiding behind the scenes. It was a stormy night. From where I was standing it seemed like at any given moment, the world stood still, like a picture. I remember the pools in Yellowstone. It was magical. She exposed her heart, and now, it is not just hers. They all have a piece of her heart. Sometimes that is the way it supposed to be on stage. It took her far, far a way, to the land of spring and summer, where it never snows. Where life is as light as a feather. The bird holds the stone, it is in her heart, she will have to release the immense powers within her to fly free. It is kicking, screaming, giving birth. Moving and forming a new world at any given moment. The universe does not have a form. It is given. Until I become the universe, this is my world, my universe. I move slowly, only one red-orange speck, flowing in that pool of magic. Moving naturally in the endless universe. We are all one speck. It's calm but very strong. Life force is ticking inside. It is in my core. It is showing me what I am missing. Look closely at the center, What do you see? A dance is formed, the paint is playing dancing in grace and beauty. I want to join that dance.